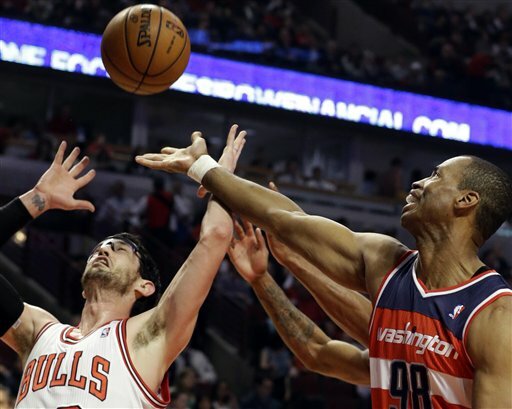 File: In this April 17, 2013 file photo, Washington Wizards center Jason Collins, right, battles for a rebound against Chicago Bulls guard Kirk Hinrich during the first half of an NBA basketball game in Chicago. Jason Collins has become the first male professional athlete in the major four American sports leagues to come out as gay. Collins wrote a first-person account posted Monday on Sports Illustrated's website. The 34-year-old Collins has played for six NBA teams in 12 seasons. He finished this past season with the Washington Wizards and is now a free agent. Billie Jean King. Martina Navratilova. Sheryl Swoopes. Natasha Kai. Megan Rapinoe. Sue Wicks. Rosie Jones. Michelle Van Gorp. Amber Harris. Jessica Adair. Liz Carmouche. Stacy Sekora. Seimone Augustus. What do all of these women have in common? They are all out professional athletes, just like Jason Collins. King and Navratilova became the world’s first out sports stars over 30 years ago, at a time when homosexuality was still classified by the American Psychiatric Association as a mental disorder. King won 12 Grand Slam titles in her long career, a laudable feat for any athlete. But how far have we come since 1973? Here’s an experiment: Name ten female athletes currently playing team sports professionally. I’d wager more of you can name ten male players. Can you name five WNBA teams? Neither can I. Do you know who Brittney Griner is? I didn’t until a couple weeks ago. Griner was the No. 1 pick in the WNBA draft, after making her name as one of the most dominant college basketball players in history. After being drafted by the Phoenix Mercury, Griner came out. Nike offered an endorsement to the first out professional athlete after holding an LGBT sports summit last June. The Internet was abuzz about who might use the deal to come out. When Nike offered it to Griner, the announcement (like her coming out) was an anticlimax. Imagine if a male basketball star of Griner’s stature came out. If Lebrón James or Dwayne Wade revealed they were gay. It would break the Internet. When the former Baylor star came out, the only headlines were about how it “wasn’t that big of a deal.” The New York Times wrote that the sports world collectively "shrugged" at the announcement. Some called this a step forward and sign that the WNBA’s tolerance. In a profile on Griner, Jay Busbee of Yahoo! Sports wrote. Those are encouraging sentiments, but why hasn’t that message been shared with a wider audience? Why is the fact that Griner’s coming out “wasn’t that big a deal” a bigger deal? Buzinski said a piece on OutSports speculating that a pro sports player might come out received ten times more traffic than a video of Griner actually coming out as a lesbian. Less than 24 hours after coming out, Jason Collins is becoming a household name. His interview in Sports Illustrated has been shared more than 200,000 times. The Los Angeles Dodgers’ Don Mattingly and Boston Celtics’ Doc Rivers compared him to Jackie Robinson. Rivers traded Collins last year to the Washington Wizards. In his 38 starts this season, Collins scored an average of 1.1 points per game. His best season was in 2004-05 with the New Jersey Nets, when he scored 6.4 points per game. With that average, he would qualify for the 104th ranked offensive player in the league, scoring a quarter of what Griner averaged with Baylor last season. Collins is a class act and a hero, but as a player, he’s no Brittney Griner. And that’s okay. He doesn’t have to be. After finishing his 14th season, Collins’ impact (as Busbee notes) will likely be felt with future generations of male pro sports players, who have their trail slightly more blazed. Collins might not be the best, but he’s here — and any sort of visibility is key. Anna Aagenes, Executive Director of Go! Athletes, says this is a gender issue at its core. The Times piece argues that female athletes don’t battle perceptions that all of their peers are straight. It’s exactly the opposite. Griner’s bravery in sharing her sexuality isn’t seen as heroic — but an affirmation of the stereotype that all female athletes are lesbians. Whereas NFL players Chris Kluwe and Brendon Ayanbadejo were praised for speaking out in support of gay athletes, their straight female counterparts haven’t been as supportive. They don’t want to uphold the gender stereotype. When Jason Collins spoke to Sports Illustrated on Monday, he accidentally hit that nail on the head. Collins credited himself as the first out athlete in a “major American team sport,” and the WNBA isn’t “major.” The only time it’s ever brought up is as a punchline. It’s sexist, but it’s not far from the truth. Lisa Leslie, one of the greatest players in the history of the sport, made just $91,000 in 2006. That was the league limit. You couldn’t make more than that. The average salary for male players in the NBA is about $5 million. Jason Collins makes $1.3 million, ten times what Brittney Griner will likely make. Collins will become a household name, and Griner will be forgotten. Before the draft, rumor had it that someone of Griner’s stature might pursue the NBA — like Michelle Wie and Danika Patrick, who had to prove their worth by competing against men. The suggestion implies Griner&apos;s only way of being taken seriously would be winning a man’s game. Forty years after King and things haven’t changed all that much. Women might have won the “battle of the sexes,” but they are losing the war.